Yeah, you read that right. Baklava oat cake! 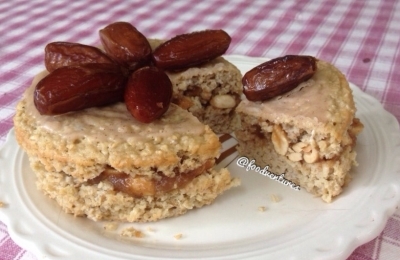 Another dessert inspired oat cake you can eat for breakfast. Because, really, you just can't go wrong with dessert for breakfast! Combine ingredients to make your cake. Preheat oven to 350 and bake for 35 minutes. Let coolâ€”itâ€™s best to let it sit overnight. Prepare your filling. Cut your â€œcakeâ€ in half and spread your filling on the bottom half. Replace the top half and spread a thin layer of maple syrup and sweet spreads maple pancakes spread. Enjoy!